It’s that time of year again! 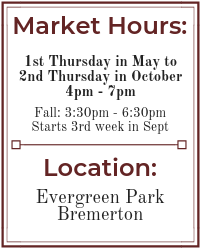 We are inviting all vendors to join us for our Annual Meeting and apply for the 2018 Bremerton Farmers Market — which will be open on Thursdays from 4-7pm, May 3 – October 11. Our 2018 Rules have been updated and can be viewed here. 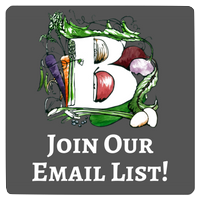 Get your 2018 BFM Vendor Application here and send in ASAP! This is a fun, community centered meeting with potluck dinner. The board of directors will be providing food for attendees, but welcome you to also bring a dish to share if you wish. We will also be holding our 2018 board elections at the dinner. If you or someone you know might interested in serving on our board of directors and further supporting the market, please consider submitting a 2018 Board Nomination Form on or before the annual meeting. Opening Day – May 3rd!